Established in 1927, Eddy Messenger Service has an unmatched depth of experience when it comes to getting shipments where they have to be…when they have to be there. 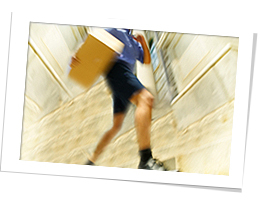 Our on demand delivery services are ideal for companies that have immediate, time-sensitive delivery requirements. Our resources, technology and experienced staff ensure that every one of these critical deliveries is performed professionally and expeditiously. Our scheduled and routed/distribution delivery services are for companies that need a dependable time-defined delivery system for pick-ups and drop-offs at a single or multiple locations. We’ll help you develop a timely and cost-effective delivery plan that is customized to your specific requirements. Our warehousing services are perfect for companies with limited storage space or who want portions of their inventory managed off-site. We can maintain a wide range of inventory at our facilities, then pack and deliver items for you, when and where you want them, 24/7. Our delivery fleet outsourcing services are a great alternative for companies of all sizes who want to redeploy their internal delivery resources to do other tasks. For example, we can replace an entire delivery fleet or assume the delivery tasks of a single employee who can then focus on their core job responsibilities. Our delivery fleet outsourcing services can help companies increase staff productivity, limit their liability exposure and reduce their overall expenditures. Our delivery services are available 24 hours a day, every day of the year. Whenever you call, you’ll speak to an Eddy Messenger Service staff member (not an automated system or third party answering service) for assistance that’s prompt, personal and professional.